This new concept car from Audi comes with an extra set of wheels. As reported by The Verge, the company announced their Connected Mobility Concept at Beijing's auto show earlier this week, and it includes an electric longboard in the bumper that charges as you drive. 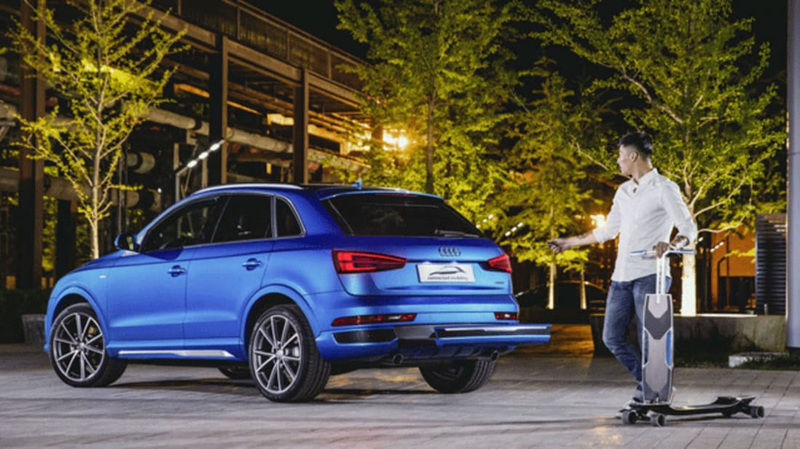 The vehicle, a spin off of Audi's Q3, would use a built-in navigation system to determine when it's best to continue driving to your destination and when you should get out and longboard the rest of the way. When it's time to switch transportation methods, the car suggests a spot for you to park. The board holds enough charge to cover 7 miles at a time and maxes out at speeds of about 19 miles per hour. Users can ride it like a traditional longboard or unfold the collapsible handle to ride it like a scooter. And to really feel like you're living in the future, users can activate the device's "cargo mode." After loading the board with groceries or shopping bags, it then follows behind you autonomously by connecting to your smartphone or smart watch. In addition to appealing to urban car owners, the innovative feature could also attract millennials. More so than the generations that came before them, millennials are choosing to drive less and instead opting for alternative means of transportation.